DESCRIPTION -- Unusual design mug from the US battleship the USS Alabama which is made of a plastic type material. HISTORY -- USS Alabama(BB-60), a South Dakota-class battleship, was the sixth ship of the United States Navy named after the US state of Alabama. Alabama was commissioned in 1942 and served in World War II in the Atlantic and Pacific theaters. Alabama was decommissioned on 9 January 1947 and placed in the reserve fleet in Puget Sound Naval Shipyard Bremerton, Washington. In 1964, Alabama was towed to Mobile Bay and opened as a museum ship the following year. The ship was added to the National Historic Landmark registry in 1986. 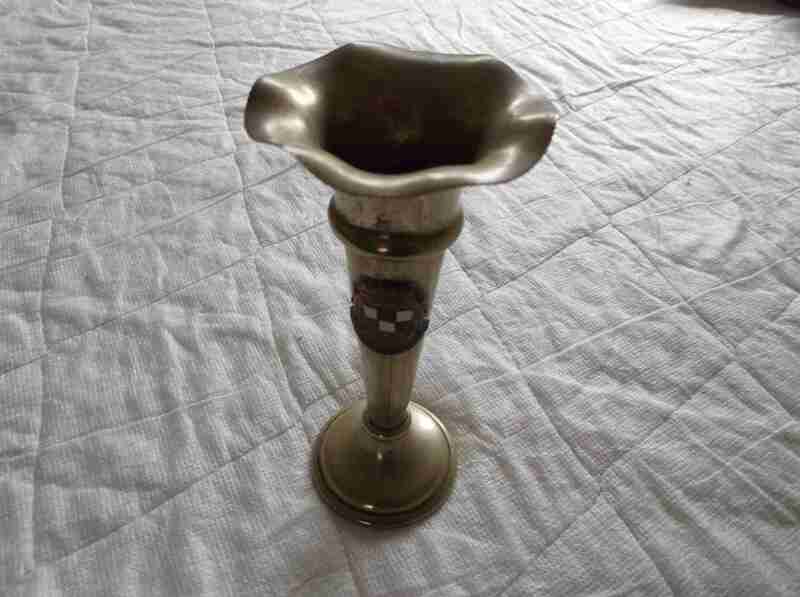 DESCRIPTION -- Dating from the 1930's and a very rare find this is a metal candle vase from the Canadian Steamship Company vessel the SS Duchess of York and it is 5" (12.5cm) high and shows the ships emblem on the front. HISTORY -- SS Duchess of York was a 20,021 ton ocean liner operated by the Canadian Pacific Steamship Company. Built in 1928 in Clydebank by the shipbuilders John Brown & Company, she was originally intended to be named Duchess of Cornwall. However agreement was reached with Red Funnel company to swap names with the latter's paddle steamer Duchess of York, launched in 1896. She was sunk in 1943 off Spain after being damaged by long range German bombers. 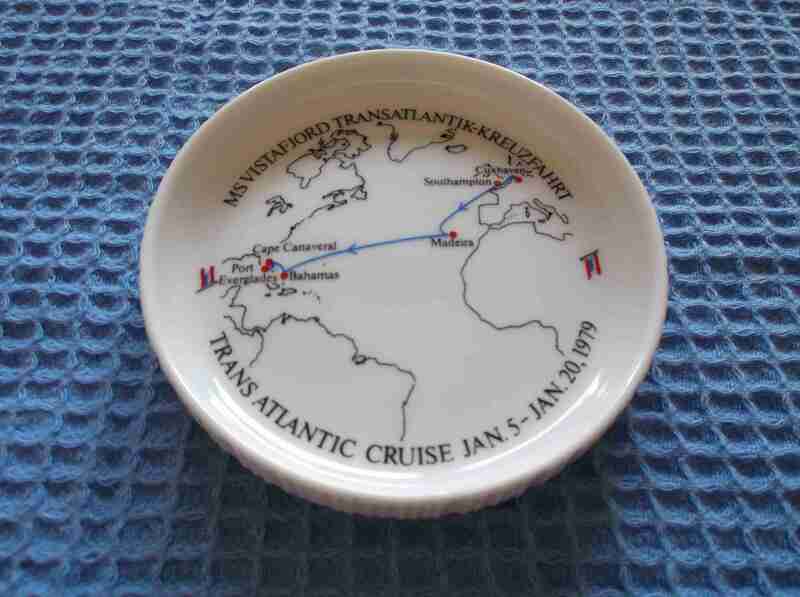 DESCRIPTION -- Souvenir from the vessel MV Vistafjord which is a dish which shows on it the route and map of a cruise in 1979 and reads 'MV VISTAFJORD TRANSATLANTIK-KREUZFAHRT' Trans Atlantic Cruise Jan 5 - Jan 20 1979. It is 4" (10.5cm) round and is in an as new condition and bottom marked by makers. HISTORY -- Cunard, under the direction of Trafalgar House Co., acquired Norwegian America Line in 1983 for US$73 million. With this purchase, Cunard gained two superb liners; Sagafjord and Vistafjord (later Caronia). Vistafjord was completed in 1975 and undertook a $30 million refit in late 1994. During this refurbishment, Vistafjord was given a completely refreshed interior and retained her high quality rating. The work included the addition of two large "owners suites" to her top decks near the funnel. 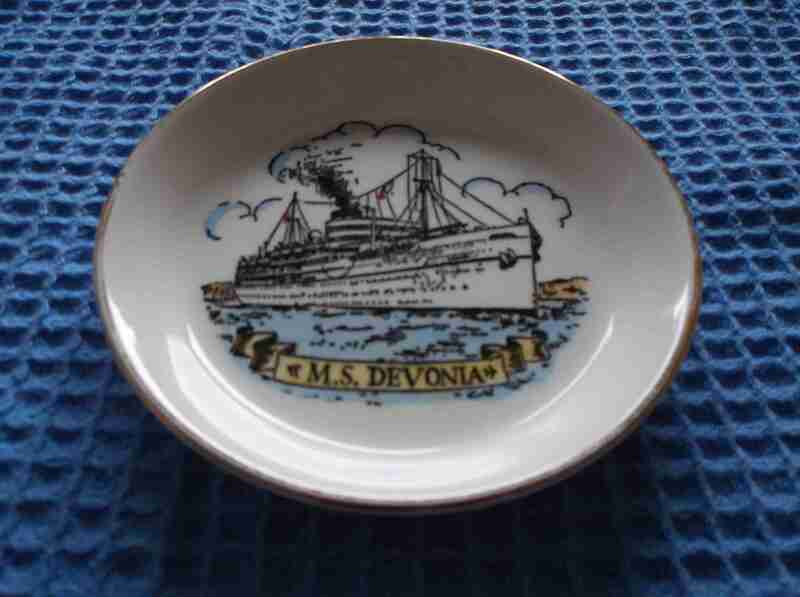 DESCRIPTION -- From the British India Steam Navigation Company Ltd this is a souvenir picture dish from the vessel the MS Devonia which is dated 1950's and is 4" (11.5cm) wide and a rare find. HISTORY -- The MS Devonia was originally called MS Devonshire and was built in 1939 as a troop ship. The vessel was refitted in 1962 and called MS Devonia. She was sold for scrapping in 1967 and scrapped in 1968. DESCRIPTION -- This item is original from the Shell Oil Shipping Company and is dated circa 1970's. 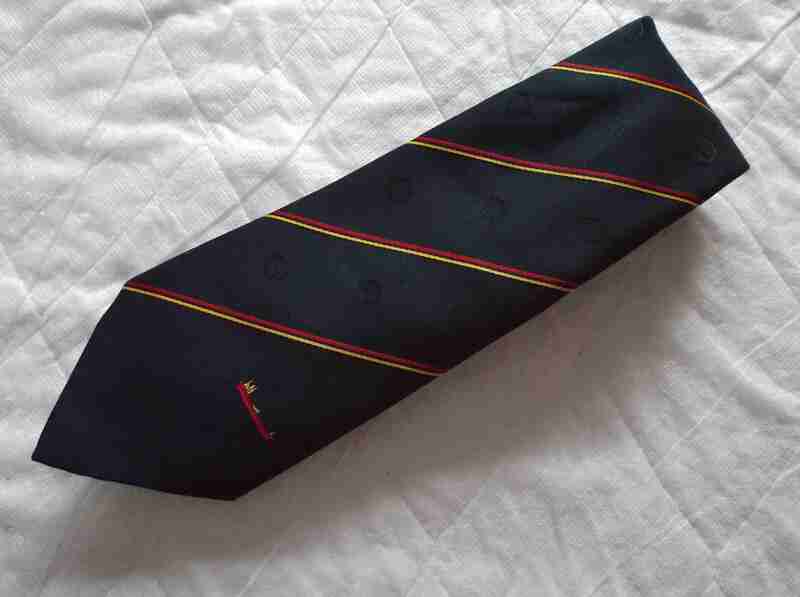 It is an original company tie which is in an excellent condition. HISTORY -- Shell has been in the business of shipping since the company's foundation in the late 1800's. Today, Shell manages one of the largest fleets of crude oil, oil products tankers and liquefied natural gas (LNG) carriers in the world, all playing a vital role in the safe and secure delivery of energy around the world. From the launch of Shell's first oil tanker, the Murex, in 1892 to today, our deep-sea vessels have continued to follow the tradition of being named after sea shells. 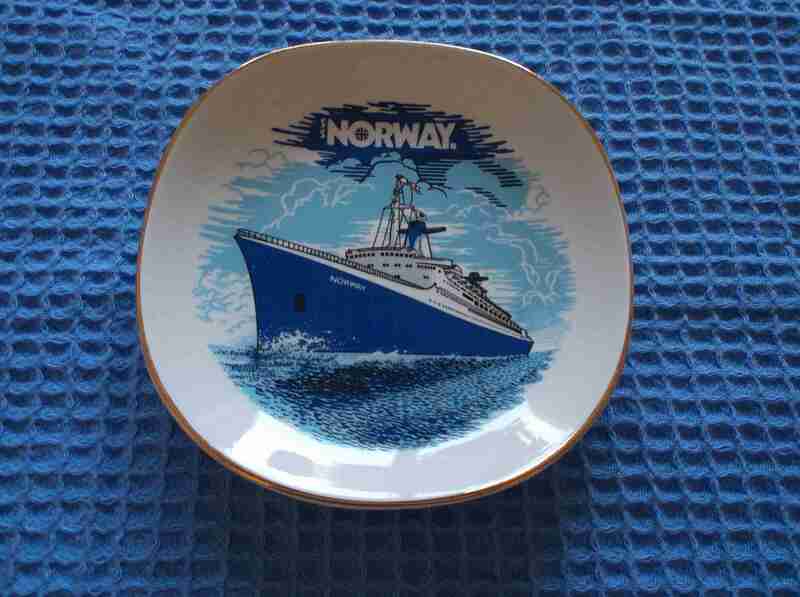 DESCRIPTION -- From the vessel SS Norway this is a souvenir dish and the size is 4" (12cm) square and in a great condition. HISTORY -- The vessel SS France was purchased by Norwegian Cruise Line (NCL) in 1979, and renamed SS Norway and underwent significant modifications that better suited her for cruising duties. She was sold to be scrapped in 2006, and scrapping was completed in late 2008. 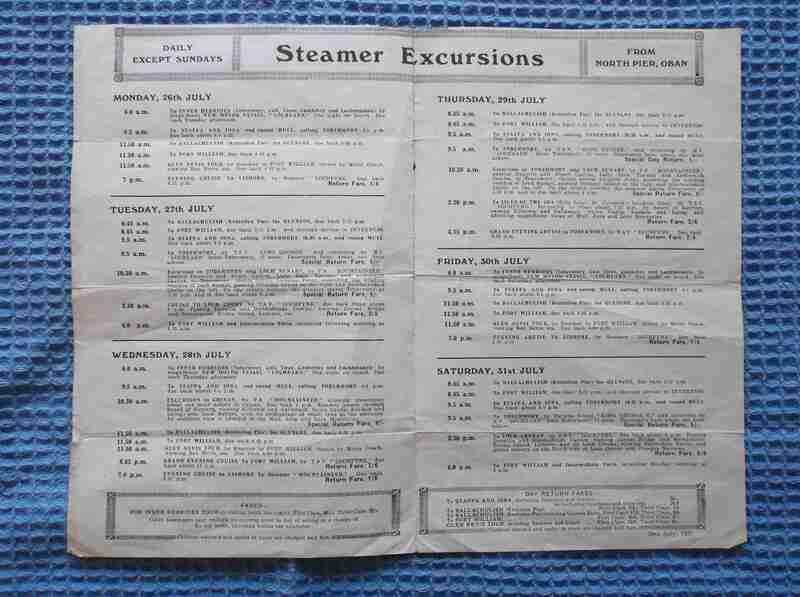 DESCRIPTION -- Great find and an early item from the Steam Packet Company dated 1937 which is from David MacBrayne Ltd who are a shipping agent for the Steam Packet Company and running an Office out of Oban, Scotland. It covered details of sailings for the TTSS King George V for the last week of July 1937 (click on the picture for a view of the inside of the leaflet). HISTORY -- David MacBrayne Ltd is a company owned by the Scottish Government. Formed in 1851 as a private shipping company, it became the main carrier for freight and passengers in the Hebrides. In 1973, it was merged with Caledonian Steam Packet Company as state-owned David MacBrayne. Since 2006 it has been the holding company for ferry operators CalMac Ferries Ltd (operating as Caledonian MacBrayne) and Argyll Ferries Ltd. DESCRIPTION -- Souvenir china mug of the vessel the Mayflower and is in a great condition. DESCRIPTION -- Booklet from the Panama Pacific Line and features the vessels 'Pennsylvania', 'Virginia' and 'California'. 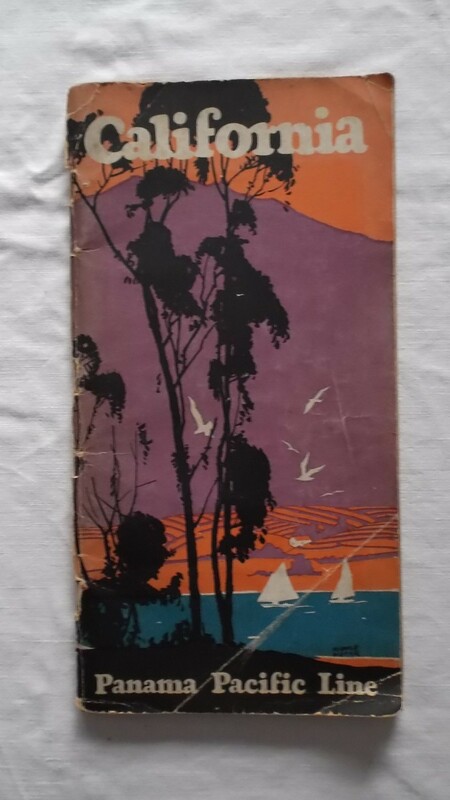 It is dated from the 1930's and contains over 100 pages and a rare find and great read. HISTORY -- Panama Pacific Line was a subsidiary of International Mercantile Marine (IMM) established to carry passengers and freight between the US East and West Coasts via the Panama Canal. Although IMM had begun preparations for this intercoastal service as far back as 1911, service began in May 1915 with the former Red Star Line (another IMM subsidiary line) ships Kroonland and Finland. When landslides in September 1915 closed the canal for an extended time, Kroonland and Finland were reassigned to the IMM's American Line. The outbreak of World War I and its strain on international shipping caused the intercoastal service to be suspended. NOTES -- Many other different items are also available from Travellers in Time and are to be found on the website. If you cannot find what you are looking for please contact us with your interest at sales@travellersintime.net and we will get back to you. 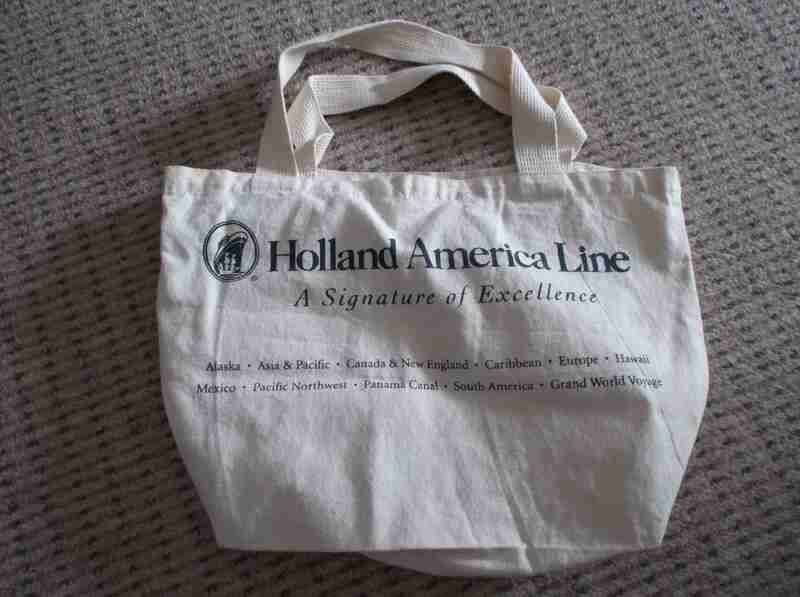 DESCRIPTION -- From the Holland America Line this is a canvas bag souvenir as sold on-board ship and the bag shows on the front the company name and is in an excellent as new condition.